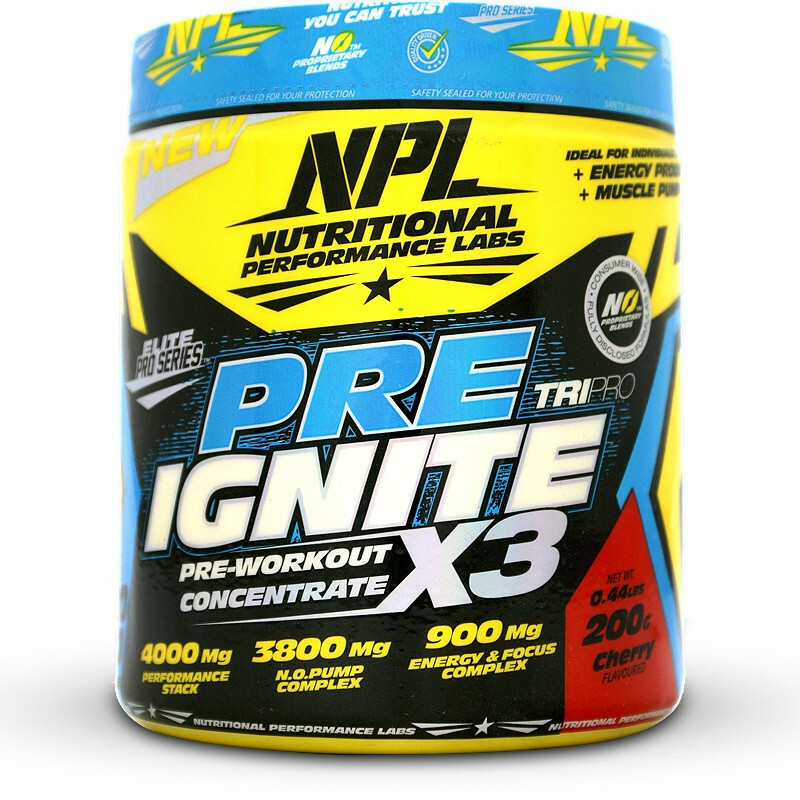 NPL Pre-Ignite is a concentrated preworkout giving athletes more energy and focus to train at their best. Most fitness experts agree that to maximise gains in the gym athletes need to train at a higher intensity. Every 2 scoops of this product will give you 400 mg of caffeine which has been well studied to be an effective sports boosting ingredient. Not only do the stimulants increase energy levels they also improve mental focus making your time in the gym more efficient. Combined with caffeine the manufactures have included 150 mg of the patented stimulant Advantra Z 6% which has been sold for over 16 years within the fitness industry. The N.O. Pump Complex contains the latest researched ingredients to promote vasodilation which is the increasing of blood vessel ‘size’ to improve blood flow for better pumps during your workouts. The combination of Creatine HCL and Beta Alanine in the performance stack help with increasing strength and endurance during your training sessions. Lifting heavier weight stimulates more muscle fiber for lean growth. The manufacturer’s recommendation of 2 scoops will give you 20 servings. Due to the strength of the product many athletes should have a great workout with just one scoop, giving them a product which lasts almost 2 months depending on how often they train. NPL Pre-Ignite is a concentrated preworkout that packs a punch if taken at the full dose. The quality formulation should give many a workout performance boost with just one scoop making this a very affordable product. *% NRV - Nutrient Reference Values for individuals older than 4 years. This product is manufactured in a facility that used materials containing milk, wheat, eggs, fish, peanuts, shellfish and tree nuts. (Allergen control in place). • Mix 1-2 rounded scoops (approx 5-10g) with 150-250ml of cold water. • Drink 15-30 minutes before your workout. • To assess your tolerance start with half a scoop and build up to the recommended dosage. Do not use if you are pregnant or nursing. Not intended for use by persons under the age of 18. Consult a physician before using this product if you have been treated for, have been diagnosed with or have a family history of any medical condition, or if you are taking any over-the-counter or prescription medication. If you are under medical supervision, consult with your physician before use. Use only as directed. Do not exceed the recommended serving size, as improper use of this product does not enhance results.